Australian pop singer and tragic one-shot Doctor Who companion Kylie Minogue's European tour is sponsored by Microsoft Kinect and Dance Central, and this crystal-studded Kinect sensor is the by-product of that union. Created by PlayBling and studded with more than 6,000 Swarowsky Elements crystals, the Kylie Minogue Kinect is styled after the singer's latest album, Aphrodite. Fans attending her European tour will be able to get down with Dance Central at the concert venues, shaking it to various songs including Kylie's own "Can't Get You Out of My Head". 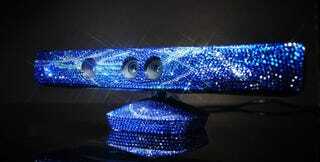 The crystal-studded Kinect is valued at more than $1,200, but it's not for sale. Kylie and Dance Central fans in Europe can score one via a contest that requires them to film themselves dancing to Kylie's song in Dance Central. No thank you. I prefer my Kinect to be covered by a fine coat of dust.